Viinturuth is a dragon who is reawakened by Alduin as part of the main quest line. He is buried in a mound near Lake Yorgrim and may be encountered while exploring the area. Viinturuth's name translates to "Shine Hammer Rage". Viinturuth can be raised once the quest The Throat of the World has been completed, and will fly around the area following his revival. He may use fire or frost depending on the player's level, and will drop the same kind of loot as other dragons when slain. Viinturuth may spawn a second time and become invisible. 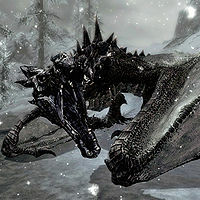 It is possible to see him with Detect Life and his corpse with Detect Dead, but his soul will not be absorbed, as is the case with other respawned dragons. This page was last modified on 5 January 2014, at 04:08.